From This Point. Forward. : Hello, Kitty! It may be 1:00am and I may be having trouble getting to sleep again, but here's hoping that at least I don't wake up with blood on my pillow this time! 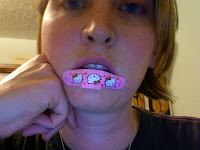 Even a stupid immune system is happier with Hello Kitty! Or something. Um, is it weird that I think that's adorable? Yeah, ok.
Hello Kitty makes everyone happy!